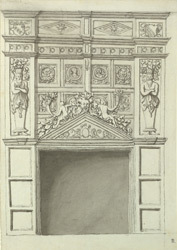 An outline drawing in ink of an ancient carved chimney-piece in Newstead Abbey. When Henry VIII closed down the monasteries in 1539, the abbey transferred to the Byron family. At the time of Grimm's visit the fifth Lord Byron was in residence. He died in 1798 and the estate passed to his ten year old great-nephew, who grew up to be the great Romantic poet and an icon of his times.